Actually I’ve been thinking about that question for some time; I remember when I was in retail I never attended Coverings. Now that I’m associate publisher of Fabulous Floors Magazine and show speaker I know why I attend Coverings. 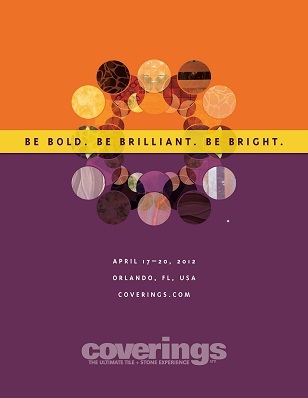 If you didn’t attend get to attend, I’ve included a link to Coverings 2012 highlights. Trade shows in general are a way to see what’s new in an industry. In addition to products, you can pick up new ideas for your business by attending seminars and speaking with other business owners. In my case, I talk with representatives from other magazines as well as speakers and share business ideas. Whenever possible, I attend the educational events. The educational arm of the conference brings out the best speakers and thinkers in our industry; I’d be crazy not to attend. Unfortunately I don’t get to attend them all. This year there were FREE seminars in Coverings Central, where social media was the topic. The seminars were 15 minutes long, and were very informative. I attended a seminar by Mark Johnson, Market.me, as he gave us the scoop on his 24-Hour Social Media Campaign. What an interesting idea and the stats were amazing. There was lots of buzz about social media and I’m sure it will continue through next year. So if social media is on your radar screen, Coverings is a must. The live installation demonstrations are another reason to attend. No matter how much tile or stone you sell, you still have to know how to install it and the best products to use.These events are sponsored by the Tile Council of North America (TCNA) and the National Tile Contractors Association. There were installation workshops on floor preparation, glass tile, and maintenance solutions.All the things you need to know about if you’re running a floor covering business. Here’s the best place to look at the big picture of our industry. I was interested in learning about Green Squared Certification and what that means to our industry. In addition is was a good place to pick up Davison’s Tile & Stone Blue Book, the tile & stone buyer’s guide. By the way, here’s their website, http://www.tileandstonebludbook.com. Coverings is very much an international show with product pavilions and manufacturers from around the world. In addition to fashionable flooring products, I noticed some striking men’s suits and women’s shoes! I enjoyed lunch, some great Italian bread and a latte in the Italian pavilion. I consider this an added bonus and definitely worth the trip. In addition I got to sit on their beautiful, red glass staircase to enjoy my food. For a minute, I felt like I was on a mini-vacation. I think the most important reason to attend is to stimulate your mind. Where else can you go to enjoy your industry, pick up new ideas and share in the excitement created by all these amazing vendors.